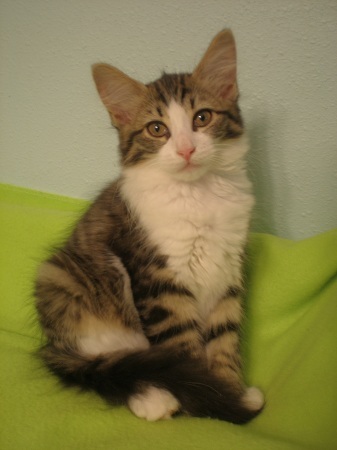 My name is Sweet Caroline, and I am a gorgeous tabby/white longhair “diva in development”. With looks like mine, can you blame me? (Hmmm. Maybe I’ll insist on being called “Princess Caroline”…) I am a charm school graduate with exceptional manners, and enjoy being primped and fawned over. I appreciate physical activities (such as wrestling with my siblings – in the most ladylike manner, of course), then taking my beauty naps by your side. I’m well-aquainted with scratching posts and…ahem…the loo. I prefer the highest point of view on the cat tree, so I may clearly see my adoring public. However, we are NOT amused by being confined to a carrier (oh, the indignity!) and taken on car rides (where IS my limosine?). If you are looking to transform your home into a castle, you only need one accessory – ME! Even though a lady never divulges her age, I will let you know I am approximately 10 weeks old, fixed, vaccinated and microchipped. Although I think I am priceless, my adoption fee is $135.